Readings: Deuteronomy 30: 15-20; Psalm 1; Luke 9: 22-25. May I speak to you in the name of the Father, and of the Son, and of the Holy Spirit, Amen. We mark Ash Wednesday here in the Church of Ireland Theological Institute each year with a retreat. We go away for a full day of prayer, guided reflection and silence. We begin with the Liturgy of the Word, followed by an opportunity for the imposition of ashes. The day concludes with the Liturgy of the Sacrament. Yesterday, we had our Ash Wednesday retreat in Skerries, where we were guided though the day by the Revd Garth Bunting of Christ Church Cathedral. 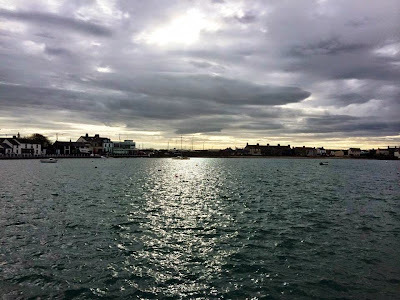 We spent most of the day in Skerries Sailing Club, with views out across the Harbour and down onto the two beaches with which Skerries is blessed, and ended with our celebration of the Eucharist in Holmpatrick Church. For some of you, I imagine, this may sound like luxury, some sort of spiritual luxury. Where you might ask, was there any challenge to deny ourselves and take up the cross? But for many of the students, a day like this is a real challenge. Not just the imposition of ashes, which is a challenge to some who have no inherited memory of this practice. But because this is a day that they begin thinking of as a day they cannot give up: they have essays and assignments to complete; they have reading, research and portfolios to finish; they have dissertation proposals that need refining and redefining. But they put away these anxieties aside, they let themselves go. What would it profit them if they had gained full marks but lost this opportunity in their spiritual formation and growth? And, in the tradition, of the Book of Common Prayer, Ash Wednesday was also marked as a Prayer Book “Day of Discipline and Self-Denial.” Vegetarian sandwiches, no pre-dinner reception when we got back, and no meat for dinner – easy for me as a vegetarian, but a reminder to some of traditions that are deeply rooted in Anglicanism. They learned many things that I hope become practice and experience in parishes in the Church of Ireland in future generations. But how many of us can say that this was the experience in many parishes in the Church of Ireland yesterday, on Ash Wednesday? The calendar of the Church of Ireland this year allows us to use to readings for Epiphany [6 January] on the Sunday before [4 January], and for the Presentation [2 February] on the Sunday before [1 January]. We have not yet come to transferring the Ascension Day readings to the next available Sunday, but there is one parish in this diocese which already has the reputation of not celebrating Christmas Day but of moving to the following Sunday. What next: move Ash Wednesday to the next available Sunday? Move Good Friday to the next available Sunday – if convenient? What happens if we lose the rhythm of the Church Calendar? The Church Year is punctuated by rhythms, such as the rhythm of weeks and a rhythm of 40 days: the 40 days from Christmas to Candlemas, the 40 days of Lent, and the 40 days of Easter. Do we give this up for the sake of the everyday secular life and its cycle of demands? Do we end up serving money and the market, rather than money and the market serving the needs of creation? It is a question worth asking ourselves throughout this Lent. This reflection was shared at the Eucharist celebrated with the Irish Chapter of the Society of Catholic Priests in the Chapel of the Church of Ireland Theological Institute on 19 February 2015.